Sea Tow Services International recently announced that Capt. Les J. Trafford, owner of Sea Tow Shinnecock and Moriches, headquartered in Hampton Bays, N.Y., was honored with a Certificate of Merit Public Service Award from the Commandant of the United States Coast Guard on behalf of the Secretary of Homeland Security. 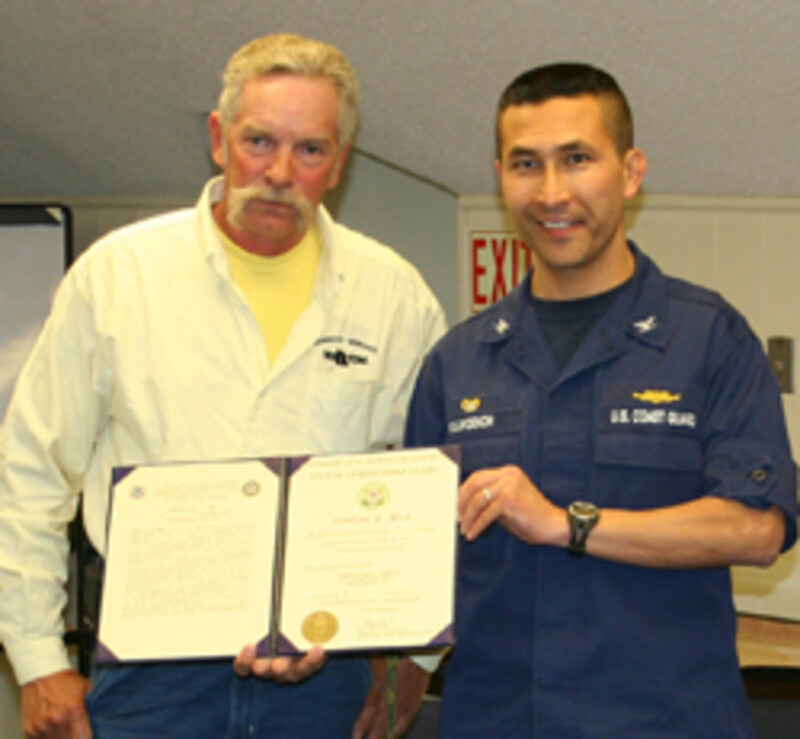 The award was presented May 15 to Trafford by Coast Guard Sector Long Island Sound commander Capt. J.M. Vojvodich at a ceremony held at Coast Guard Station Moriches, N.Y.
Trafford, who has been a U.S. licensed Coast Guard Captain for more than 22 years, was cited for, "his exemplary commitment to maritime safety and support of [Coast Guard] Station Shinnecock, Aids to Navigation Team Moriches, and the local boating community from January 2009 to October 2011. Throughout this period, Trafford has devoted countless hours providing invaluable local knowledge of the ever-changing shoals of Moriches Bay and Inlet. His efforts were instrumental in recent aids to navigation operations." • In conjunction with the [ATON] spring seasonal reliefs for the past two years, Trafford has conducted an area of operations transit with the officer in Charge of ANT Moriches to show exact positions of shoals that have developed over the winter. • In the spring of 2011, he launched in advance of Coast Guard ATON assets to survey the channel created by the Army Corp of Engineers during a federal aid relocation project. • On Aug. 3, 2011, he assisted CG-45310 after she had become disabled off Moriches Inlet by towing the vessel and crew to Sector Field Office East Moriches to effect repairs. • Trafford&apos;s timely reports of ATON discrepancies have led to the timely repair of aids to navigation and a safer waterway for the local boating community. • Trafford personally assisted Coast Guard Station Shinnecock in the creation of a master chart encompassing the entire area of operations, which included a comprehensive list of boat ramps, marinas, road accesses, and actual first-hand depth soundings of all of the creeks and rivers. This information significantly decreased the rate of qualification time, reduced the risk to operating boat crews through familiarity with the area, and provided a better service to the boating public.